Gumbo is a traditional New Orleans stew, often served over rice, that contains meat or seafood, vegetables and seasonings. Properly storing leftovers allows you to enjoy a delicious meal the next day without concern about bacterial growth that could make you sick. Recipes that call for shellfish require extra caution as shellfish spoil much more quickly than other types of meat. Storing leftover gumbo promptly keeps it safe to eat for later meals because cold temperatures slow spoilage. The U.S. Department of Agriculture recommends placing leftovers in the refrigerator or freezer within two hours. If you are serving the gumbo outdoors, where temperatures can reach 90 degrees Fahrenheit or above, store leftovers within one hour. 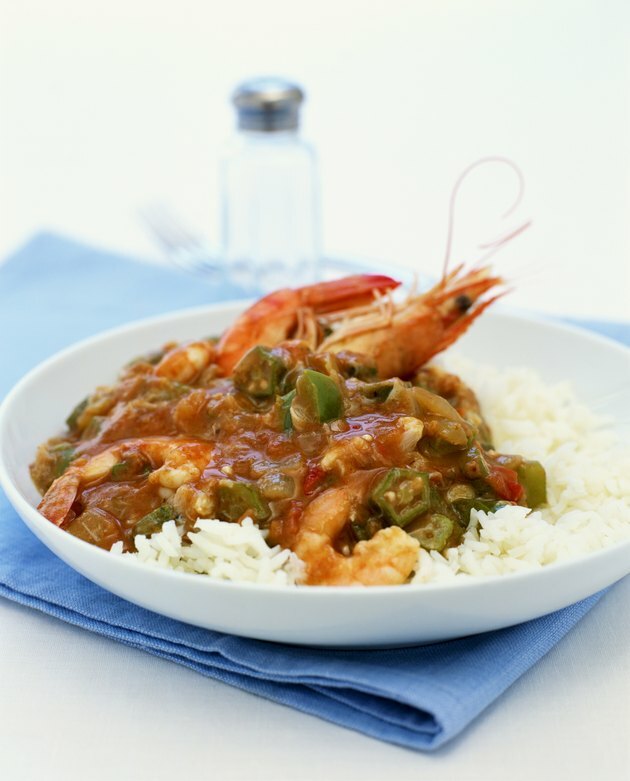 If your pot of gumbo sits out longer, it is better to throw it away to prevent illness from eating spoiled food. Transfer leftover gumbo to small, shallow containers and place in the refrigerator or freezer. This allows the cold air to circulate throughout the gumbo, slowing bacterial growth and preventing your leftovers from spoiling. Plastic containers with lids work well for refrigeration, and zip-top storage bags work well for freezing leftover gumbo. Transfer the gumbo hot or allow it to cool slightly before storage. Taking gumbo to a family get-together or party or in your lunchbox requires caution to prevent spoilage, particularly if no refrigeration is available or the trip is a long one. Place the gumbo in a cooler and cover it with ice or frozen gel packs. An insulated cooler stays cold longer than a plastic one. Once the ice packs have melted, spoilage can occur, making it important to eat the gumbo right away or get it into a refrigerator or freezer. Another option is to freeze the gumbo prior to transporting it, which gives you a longer period before spoilage begins. Reheat the gumbo before eating or serve it cold. Even properly stored food will go bad eventually. Eating your gumbo within the safe period prevents spoilage and reduces the risk of getting sick. Refrigerated gumbo made with shellfish or chicken is safe to eat for one or two days, and gumbo made with ham or sausage keeps refrigerated for about one week. Freezing gumbo prolongs its shelf life, allowing to you make a large batch and thaw smaller portions for a later meal. Use within three to six months to prevent spoilage. If you are ever in doubt about whether gumbo is spoiled, throw it away. WSFA: How Long Will Food Last in the Refrigerator? How Long Can You Eat Chicken Leftovers? Can I Get Sick From Eating Bad Meat Even After Cooking It?